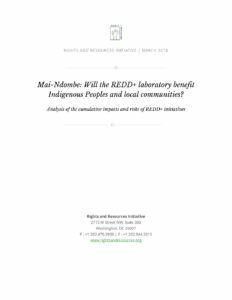 Mai-Ndombe: Will the REDD+ Laboratory Benefit Indigenous Peoples and Local Communities? This study aims to assess the cumulative risks and impacts of all REDD+ initiatives in Mai-Ndombe on the rights and subsistence of local communities and Indigenous Peoples, using existing tools while taking into account gray areas of the REDD+ process. Findings come from existing project documentation, field studies conducted in recent years, and a series of interviews with REDD+ stakeholders in Mai-Ndombe. The study provides a mapping of all existing and planned REDD+ initiatives in the province, as well as a cross-cutting contextual analysis of risks which connects REDD+ to human rights. This is followed by an assessment of these initiatives’ cumulative impacts as well as of national and project strategies to address and reduce risks. It thus offers a perspective on the link between the accumulation of REDD+ initiatives and conflicts at different scales. Fragile and incomplete governance infrastructure. There is no apparent coordination between the large number of REDD+ initiatives under development in the province. Moreover, the preparation phase has been declared over even though not all governance tools have been created and operationalized. An independent observer has not yet been mandated and the local governance of the projects suffers from a lack of attention as to the composition of the local development committees, which are not representative of the communities they speak for. Lack of coherence between the emerging structure and the drivers of deforestation. 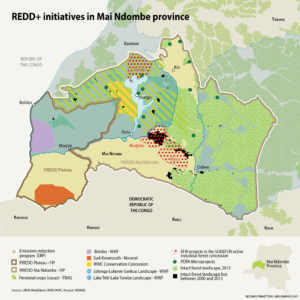 The REDD+ approaches pursued in Mai-Ndombe make it impossible to address the structural factors—both current and future—responsible for deforestation. The strategies currently being considered lack perspective on the forest industry, the anticipated impacts of the migratory phenomenon, and the increased exploitation of resources that are not yet marketed, among other things. Absence of concrete measures to secure communities’ land rights and reduce the risks of associated conflicts. The complex land dynamics in Mai-Ndombe are underestimated by all initiatives in the province. Little or no attention is given to: (i) the land insecurity of local communities and Indigenous Peoples; (ii) land grabbing and price inflation; (iii) customary practices and sharecropping; and (iv) the risks of conflict, displacement, and unlawful capture of REDD+ benefits. In addition, the land reform process is evolving independently of REDD+ governance consultations, and community forestry remains underutilized as an anchor for communities in REDD+. Limited integration of Indigenous Peoples, local communities, and women. Marginalized populations in Mai-Ndombe are not included as one of the enabling pillars of REDD+. Communities are poorly informed about the processes that have mainly been conducted in Kinshasa; FPIC is applied partially and unevenly; and the role of women in land management has been ignored, while they have been edged out of the governance of initiatives. In the absence of recognized land rights for rural communities and systematic and independent support for women’s participation in decision-making bodies, the concurrence and accumulation of REDD+ initiatives run the risk of increasing the precarity of an already vulnerable population. Uncertainty regarding the beneficiaries and the achievement of co-development objectives. The potentially negative impacts of REDD+ are poorly understood and there is currently no provision allowing communities to access the proposed benefits. Given the history of poor natural resource revenue sharing and the inadequacy of the proposed participatory approaches, the initiatives pursued will tend to favor the emergence of private actors, reduce the benefits for the poorest people, and reduce state accountability for forest conservation and community ownership of REDD+ goals. See all maps from the report here.